Contemporary art collecting has become very popular in recent years, particularly in Wandsworth following the success of previous Wandsworth Arts Festivals. Most people prefer to meet artists to talk about their work in a more relaxed setting than the sanitised, clinical white cube of commercial galleries. 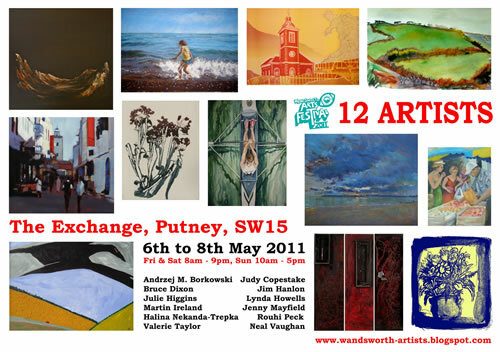 This is the sixth collective show to be put on by the Wandsworth Artists Cooperative, a community of talented artists with a successful track record of exhibitions over the past 3 years. Their group shows cover a range of media and genres. This exhibition, comprising of work by 12 artists, is open to the public between May 6 – 8 between 9am – 8pm, inside the Atrium, opposite Waitrose. The work has been carefully chosen to illustrate diversity. Launched in April 2008 at the Old Picture House, Garratt lane, WAC has continued to encourage the professional development of its members and increase public awareness of contemporary art by local artists. WAC are self-managed and self financed to maintain critical independence. The WAC provides local artists with affordable opportunities to exhibit & sell original artwork. The group currently comprises of about 14 core artists with a broad range of skills and styles. Work on display is available at prices to suit all pockets.